Having slipped back into the sealed portion of the hymnal, I wasn’t feeling too excited about the current batch of hymns. Though, #78 is on its way, one of my favorites. 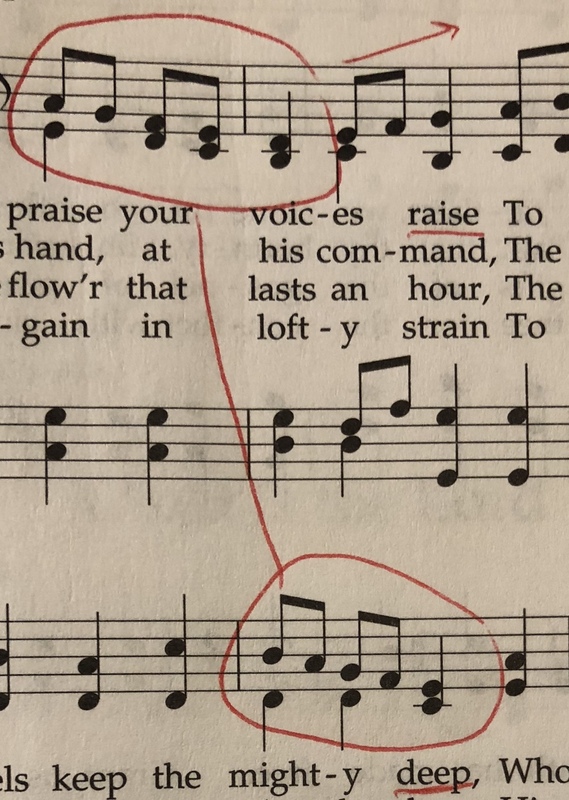 What a pleasant surprise to re-discover Hymn #75, "In Hymns of Praise." I know I've played through this hymn multiple times in the past, but it's not the most familiar hymn in the book. Which is too bad, because it's a keeper through and through. The music and words are an excellent match, which always helps. The tune is active and shapely. It keeps the ear moving forward and it's placed in a good congregational register. The use of repetitive melodic and rhythmic kernels make the tune memorable, even after a first listen. The harmony is very standard. The only chromatic element, at the end of line 3, is a standard 5 or 5 chord. Yet the active eighth-note motion in the bass line and the dotted quarters keep the harmony alive and fresh. Line 1 begins with a leap up from D to B followed by a swooping down. The swoop down moves back up right away on "voices raise." The line ends "on high" with a nice rise to the high D.
Line 2 begins with an opposite shape. It goes up in quarter notes and then falls in the 2nd bar on "mighty deep." Notice how "mighty deep" and "praise you voices" from the 1st line look a lot alike. In fact, the tune is the same, but "mighty deep" is set 1 step higher. That's one of those cohesive melodic moments. Together, lines 1 and 2 make a Question & Answer phrase. The Question presents melodic material and ends on the 5 chord, a half cadence. We know there's more to say. Then line 2 begins to answer with similar music that brings us back home to the 1 chord, an authentic cadence. Line 3 begins another Question & Answer phrase. Rather than starting on exactly the same 1 chord that line 2 ended on, line 3 starts in 1st inversion. 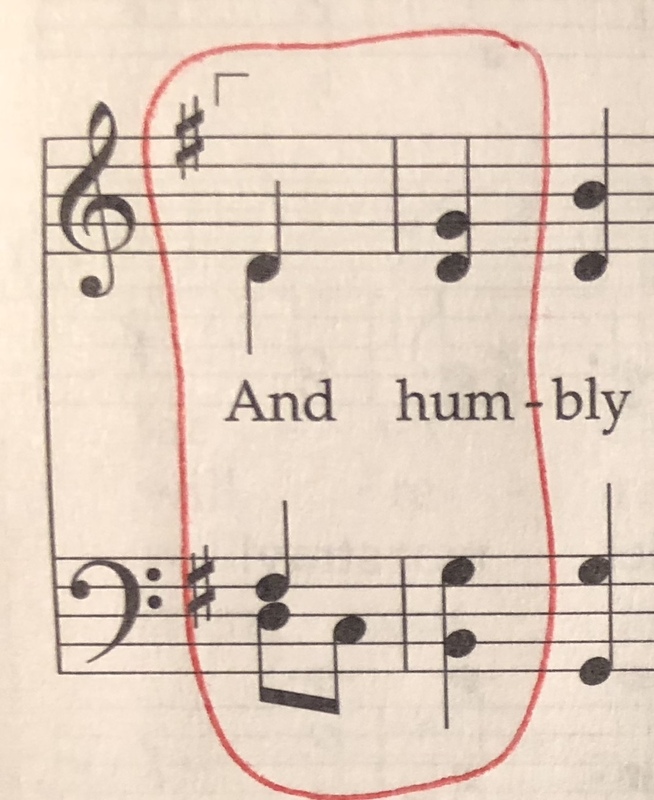 Then we get a lovely upward stepping melody line bring us to the "adore"-ing high D.
F#-G-A, then G-A-B, then A-B-C# which leads inevitably to high D. This kind of reminds me of line 3 in Hymn #66, "Rejoice the Lord is King." Do you hear it? Similar rhythms and similar steady climb up the scale. Line 4 gives the Question of line 3 the same answer as before. The only difference is how the line begins. Both go from a 5 chord to a 1 chord, but line 4's version is re-voiced just a bit. The bass line steps down from D to C to B instead of the alto. This requires a slight re-voicing of the 1 chord on the down beat. Hymn #75 is a keeper for sure! I'm gonna have to add this to my list of great but somewhat obscure hymns for my ward choir to sing for the training of the congregation. That's all for today! I hope you enjoy General Conference. It should be interesting. All kinds of rumors are flying around. This is a nice, light hymn with a good, solid tune. I think the tune is good and matches the text very well. 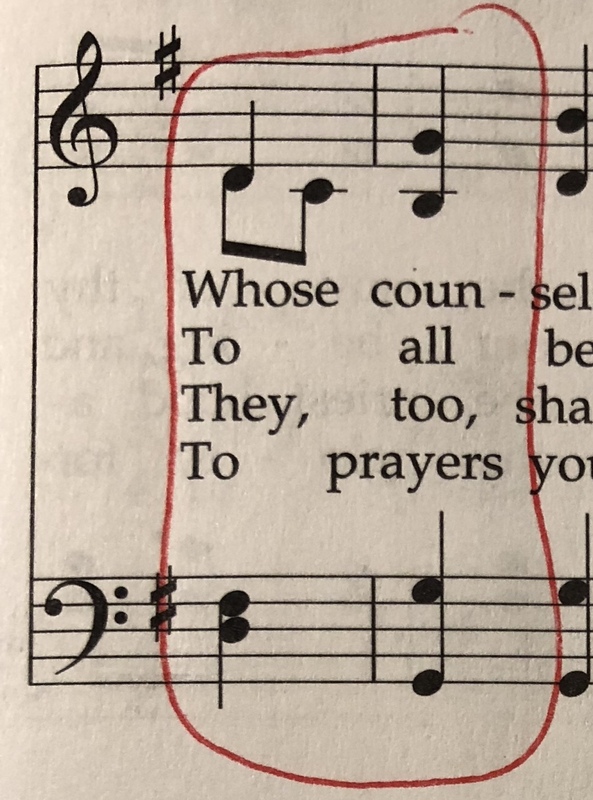 While it is a good text and tune for a hymn, it doesn’t seem to me that there is much that is noteworthy or outstanding about the tune, just as there is nothing to fret over. It just seems to be a nice, solid tune, but not too memorable. But that is just fine with me, as I think it works well for its intended role as a hymn of praise. For this hymn to have the proper drive and momentum, it would be imperative to feel this hymn in two. A good tempo to give this tune nice drive and brightness is half note equal to 56 beats per minute (quarter note equal to 112). That seems to be a very good, lilting tempo that this tune desires. A nice bright chorus to mixture is called for with this hymn.